Sure, biking might primarily be considered more of a warm-weather sport, but if you happen to particularly enjoy outdoor cycling as part of your regular fitness routine, you definitely don’t have to store your bike away when winter comes along. It might take a little bit of extra effort and a few more layers of spandex, but riding your bike outside during the wintertime can be just as enjoyable as any other time of year. The right gear and some simple preparation will keep you riding comfortably all winter long. Below, My City Bikes, the national public health campaign for beginner cyclists, lays out everything you need to know about biking in the winter. Layering is key to a successful (and enjoyable) winter ride. These three layers will keep you comfortably warm: base, thermal and wind-proof. 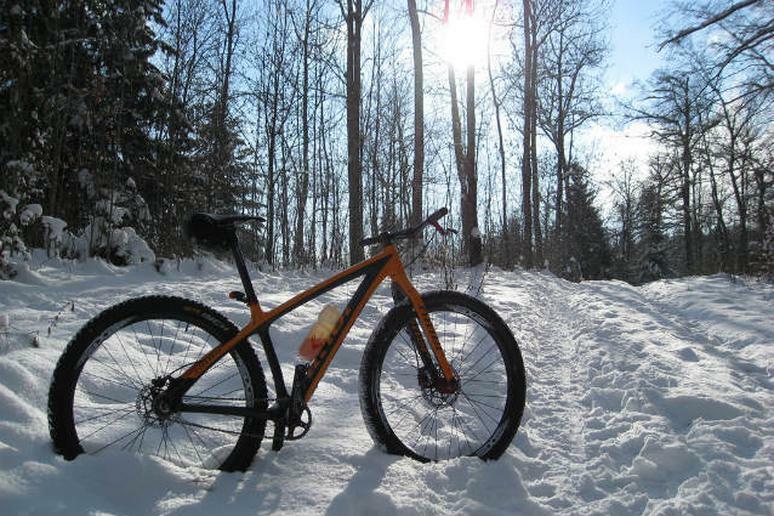 To get a bike just for winter riding go for a “fat bike” which has wide, thick tires with tread that can grip in even snowy conditions. Otherwise a mountain bike can be used, or seasonal tires from a local bike shop can be added to a commuter or road bike to give extra tread. "If you're really committing to biking this winter you'll get a lot out of a fat bike," said Peter Armando, cyclist and My City Bikes programmer. "They're really fun to ride and feel very secure which is ideal for a new rider. But if you're not 100 percent sure how you'll like winter biking, seasonal tires are a really great option because you don't have to get a new bike. You can just take your current bike to your local bike shop and switch out the tires for ones that will go through winter rain, slush and snow better." My City Bikes is the public health project benefiting communities across the United States by providing a simple mobile resource that encourage and support beginner cyclists. Whether for fun, fitness or transportation, My City Bikes serves as a definitive guide to each participating community's cycling opportunities. Local bike shops, bike-friendly businesses and municipal governments across the United States are bringing My City Bikes to their home towns to empower individuals to improve their physical and environmental health by simply pedaling a bike.